If you are visiting the city as a large group, then you would need to hire a 50 passenger bus on offer from reliable charter bus rental Clearwater services. If you have come to our site, then you need not look elsewhere. Right from arranging a mini tour of the city to arranging a bachelorette party on wheels, you will find our charter bus to be affordable and attractive. Need more info, give us a ring 813-514-6980. If a small group wants to enjoy a trip to the nearest airport or attend a wedding party, our 20 passenger mini buses are there to make your travel convenient and cozy. You can take advantage of our top notch bus charter services to enjoy every bit of your travel. We offer all modern amenities like LCD TVs, an on board bathroom & comfortable seating. Clearwater party bus rentals are also available for anyone looking to take it up a notch! If you are looking to enjoy a once in a lifetime experience while traveling around Clearwater and its neighboring cities, then opt for our 30 passenger shuttle buses to easily accommodate your group. You can visit our website and look for a bus rental that you want. Enter the details asked for in the online reservation form and we will give you the travel quote within minutes. 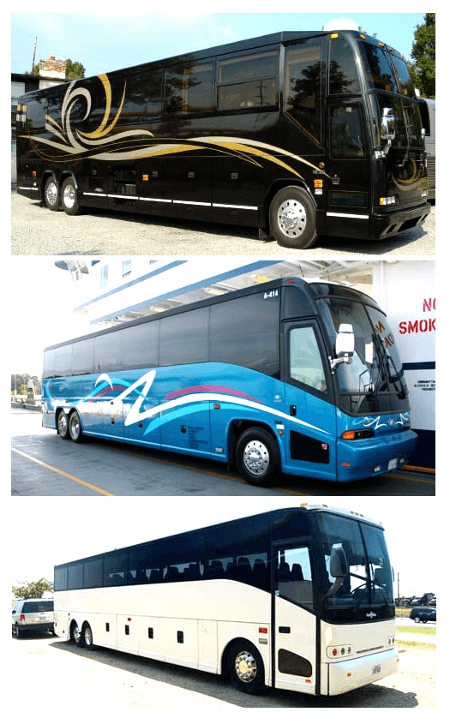 We offer you all kinds of bus services that you need depending on your budget. If there is a need to travel to a big party for a group of 35 to 40 people, then you can hire our 40 passenger charter buses. Your party starts once you enter our bus. Still have questions, call 813-514-6980. Clearwater is one of the favorite vacation spots for tourists. Hire our charter buses to visit some of the popular attractions in the city. Clearwater Beach; a popular white sand beach, clear blue waters and hosts a resort as well. Early Bird Dinner Theatre; a popular venue to enjoy matinee and afternoon plays with lobby bar and buffet dinner. Cliff Stephens Park; it is a green space with waterfront, disc golf and fishing area. Clearwater Marine Aquarium; an aquarium where you get to see turtles and marine mammals. A fun place for entire family. Jack Russell Memorial Stadium; an amateur baseball stadium that was once the spring home of the Philadelphia Phillies. Hire our shuttle buses to enjoy safe and reliable transportation to and from the airport. We have trained chauffeurs waiting at the arrival on time to pick you up and transfer to your destination in the city. The chauffeurs are aware of the traffic congested roads in the city and will ensure that you reach St. Pete-Clearwater International airport on time in the bus rental you hire. Alternatively, you can also take advantage of our classy Clearwater limousine service. If you take our charter bus for a group tour, then we offer you safe and quick transportation to the cities in and around the city. The cities that you can visit are: Palm Harbor, Largo, Elfers, Holiday, East Lake, Seminole, Dunedin, Saint Petersburg, Gulf Port and Tarpon Springs.